SUMMARY: "The medium is the message," according to Marshall McLuhan. In this week’s MarketingSherpa Chart of the Week, we take a look at data about the most effective channels for content to help you along the path to achieving your marketing objectives. Last week, we shared a chart showing where marketers produce content for search engine optimization. But, does usage map to effectiveness? In other words, what highly effective tactics are being underutilized? Q: Please indicate the LEVEL OF EFFECTIVENESS (in terms of achieving marketing objectives) for each of the content products your organization is using. What content will attract organic search traffic? Once prospects get to the content, will it help us meet our marketing objectives (e.g., conversion, engagement, etc.)? Where should we create that content? Also ranking highly are case studies, customer reviews, white papers, microsites and articles. Podcasts and social media were among the least effective. And yet, much like Lake Wobegon where all the children are above average, podcasts still had 79% of marketers who viewed the channel as somewhat or very effective, and social media garnered 82% of marketers saying the channel was somewhat or very effective. 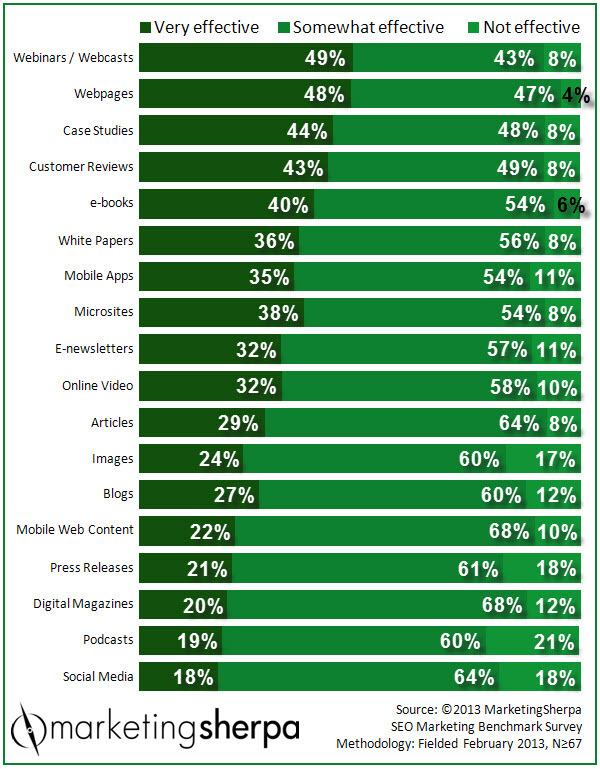 While webpages were highly used (by 79% of marketers, according to last week’s chart), it’s interesting to note while webcasts were considered most effective, only 33% of marketers are using them and just 21% of marketers create e-books. Let’s take a deeper dive into the data. When we break out the data, B2B (which includes B2G) marketers put webinars and webcasts at the top for effectiveness, with 53% ranking them very effective and 94% considering this channel to be very or somewhat effective. e-books (95% very or somewhat effective), white papers (95% very or somewhat effective), and articles (96% very or somewhat effective) also did quite well. Still, only 49% of B2B marketers utilize webcasts with just 20% creating e-books. On the B2C side, 96% of marketers considered webpages to be very or somewhat effective, making it the top channel for that cohort. Incidentally enough, webinars, e-books, and white papers did not even receive enough of a response to be considered. Not surprisingly, webpages are the most frequently used channel by B2C marketers, with 76% focusing on content for this channel. How can you help your audience solve its pain points and meet its goals? The above question is a key question for every marketer to ask as they contemplate their marketing strategy. To make a sweeping generalization, B2C marketers tended to favor simpler channels for content (with customer reviews and articles also performing well, in addition to webpages) while B2B marketers tended to find more complex avenues for content more effective. This shouldn't surprise many experienced marketers, as most B2C marketers offer a more direct path to sale, while many B2B marketers have a more complex sales path. Hopefully this data will help you decide on the proper channels for your content. How can you best help customers? Do they need simple snippets of information, or more complex, deep-dive explanations? At which point in the sales process do they need these types of information? And, how can you deliver it to them?